1. Plague. Anger of Achilles. 2. Agamemnon's dream. Trial of the Achaians. Catalogue of ships. 3. Swearing of oaths. "Viewing from the Walls." Combat of Alexander & Menelaus. 4. Breaking of the oaths. Agamemnon reviews his troops. 6. Glaukos. Hektor and Andromache. 7. Combat of Hektor and Aias. Burial of the dead. Building the wall. 8. The Trojans advance. Zeus stops the interference of Hera. 11. "Aristeia" of Agamemnon. Achilles sends Patroklos to inquire. 12. Battle about the Wall. 13. Fighting at the ships. 14. Beguilement of Zeus. Greeks advance. 15. Retreat to the ships. 17. "Aristeia" of Menelaos. Fight over body of Patroklos. 20. Battle of the gods. 21. Achilles fights the River. ILIAD 1. Plague. Anger of Achilles. 1-7 Prologue: Sing, Muse, of the Wrath of Achilles. 8-32 Chryses tries to ransom his daughter; Agamemnon roughly rejects the ransom and dismisses the priest. 33-52 Chryses prays to Apollo, who sends a plague among the host. 53-67 After 10 days, Achilles summons an assembly. not end until Chryseis is returned. 101-147 Agamemnon reluctantly gives up Chryseis, but demands a replacement. Achilles points out that no prizes are available. Agamemnon threatens to take another's prize, even Achilles'. 148-171 Achilles becomes angry and threatens to go back home. 172-187 Agamemnon will take Achilles' prize, the girl Briseis. 188-222 Achilles is about to slay Agamemnon, but Athene stops him. 223-244 Achilles rails at Agamemnon. He declares that the Achaians will some day long for his help and not have it. 245-284 The aged Nestor tries to make peace between the two. 285-303 Achilles and Agamemnon make an angry reply. 304-317 The assembly breaks up. Odysseus takes Chryseis back home. 318-344 Agamemnon bids the heralds Talthybios and Eurybates to fetch Briseis, which they do. 345-363 Achilles cries to his mother; Thetis comes and asks of his sorrow. Zeus to grant victory to the Trojans. Thetis promises to ask Zeus. 428-445 Odysseus brings Chryseis to her father. 446-458 Chryses prays to Apollo to stop the plague, which he does. 459-487 Odysseus performs a sacrifice and returns home after the feast. 488-492 Achilles remains beside his ship. 493-530 Thetis supplicates Zeus, and her prayer is granted. 531-567 Hera scolds Zeus, who sharply rebukes her. 568-594 Hephaistos counsels submission to Zeus, and tells how he himself was once punished for interfering in one of their quarrels. 594-611 Hera submits. Hephaistos plays the cupbearer, and the gods laugh at his antics. The gods go to bed. ILIAD 2. Dream. Trial. Catalogue of Ships. 1-34 Zeus sends a (false) dream to Agamemnon, bidding him to arm the host, for now he will take Troy. 35-52 Agamemnon awakes and orders the heralds to call a general assembly. 53-83 Agamemnon calls a council of leaders, and tells them of his dream. He proposes a trial of the host. 111-141 As a trial of the host, Agamemnon proposes returning home. 142-154 The host rush to the ships and prepare to sail. 155-166 Hera sends Athena to stop the flight of the host. 167-181 Athene orders Odysseus to stop the flight. 182-206 Odysseus stops the flight through taunts and threats. 207-242 The host reassembles. Thersites abuses Agamemnon. 243-277 Odysseus scolds Thersites, and strikes him with his staff. 278-332 Odysseus urges the host to stay until they sack Troy, which will be in the tenth year of the siege. 333-393 Nestor encourages the host to stay. 394-393 Agamemnon orders the host to arm for battle. 394-431 The army disperses and Agamemnon performs a sacrifice to Zeus. 432-440 Nestor urges Agamemnon to summon the host to battle. 441-458 The heralds summon the host to battle, and Athene inspires them with courage. 459-483 The host is gathered and marshalled into battle array. 484-493 Sing, Muse, of the chieftains and peoples gathered against Troy. are drawn up on the plain. 816-877 The catalogue of Trojan contingents and their allies. ILIAD 3. Oaths. Viewing from the Walls. Single combat of Paris & Menelaus. 1-14 The two armies approach each other in battle. 15-29 Paris challenges the champions to combat; Menelaus is overjoyed. 30-57 Paris runs at the sight of Menelaus, and is scolded by Hektor. 58-75 Paris agrees to fight Menelaus alone for Helen. 76-94 Hektor announces Paris' offer to the Greeks. 95-120 Menelaus agrees, but demands an oath be sworn. fight for her in single combat. 130-160 Helen goes to the walls to watch the fight. The old men speak of her with admiration. 161-170 Priam speaks kindly to Helen and asks her to name the Argive heroes. 171-190 Helen points out Agamemnon. 191-202 Helen points out Odysseus. 203-224 Antenor tells how Odysseus and Menelaus came to Troy long ago. 245-258 The heralds bring victims and summon Priam to go and make the oath to the Achaians. 259-301 Priam and Agamemnon swear an oath that the victor will take Helen. 302-323 Priam returns to Troy. Hektor and Odysseus measure out a space. 324-339 Paris and Menelaus put on their armor. 369-382 Aphrodite saves Paris, and carries him back to Troy. 383-420 Aphrodite bids Helen to go home to Paris. Helen reluctantly goes. 421-440 Helen scolds Paris, who replies that the gods control all. 441-461 While Helen and Paris lie together, Agamemnon demands Helen from the Trojans since Menelaus won in the combat. ILIAD 4. Breaking of the oaths. Inspection by Agamemnon. 85-103 Athene persuades Pandaros to shoot an arrow at Menelaus. 104-147 Pandaros, shooting with stealth, treacherously wounds Menelaus. 148-182 Agamemnon fears for Menelaus' life. 183-219 Menelaus dismisses Agamemnon's fears. They send for the doctor Machaon, who tends to the wound. 220-249 The Trojans attack. Agamemnon encourages his men to the fight. 250-271 Agamemnon urges on Idomeneus. 272-291 Agamemnon praises the two Aiantes. 292-325 Agamemnon comes upon Nestor, who is urging on his men. 326-363 Agamemnon chides Odysseus, but afterwards makes amends. 401-421 Sthenelos makes an angry reply, but Diomedes bids him hold his peace and prepare for battle. 422-445 The Achaians and Trojans move forward to the battle. 473-506 The prowess of Aias; of Odysseus. 507-516 Apollo urges on the Trojans; Athene the Achaians. 517-544 Thracian Peiroos kills Achaean; Aitolian Thoas kills P. in revenge. ILIAD 5. The Aristeia of Diomedes. 35-75 The battle goes forward. 76-94 The fury of Diomedes is like a winter torrent. 111-120 Sthenelos draws the arrow from Diomedes' shoulder. 121-132 Athene gives Diomedes strength and allows him to see the gods. She bids him fight with no immortal except Aphrodite. 133-165 Diomedes slays various Trojans. 166-178 Aeneas urges Pandaros to shoot Diomedes. 217-238 Aeneas bids Pandaros join him to fight Diomedes. 239-250 Sthenelos advises Diomedes to flee before Aeneas. 297-317 Diomedes knocks Aeneas to the ground with a great stone. 318-351 Aphrodite comes to save Aeneas. Diomedes wounds her on the wrist. She drops Aeneas, but Apollo bears him away. 352-362 Aphrodite asks Ares for his chariot for her return to Olympus. 363-380 Aphrodite tells her troubles to her mother, Dione. 416-430 Athene jeers at Aphrodite's wound. 443-459 Apollo sets Aeneas in his temple in Troy, where Leto and Artemis heal him. Apollo arouses Ares against Diomedes. 460-469 Ares stirs up the Trojans. 493-532 Hektor urges on the Trojans. Aeneas returns. 541-560 Aeneas slays Krethon and Orsilochos. 561-575 Menelaos and Antilochos rescue the corpses. 576-589 The prowess of Menelaos and Antilochus. 590-606 Diomedes retreats before Hektor. 607-626 Prowess of Hektor and Aias Telamonides. 627-662 Tlepolemos taunts Sarpedon, and they wound each other. 663-688 Tlepolemos and Sarpedon are carried off. Odysseus kills various Lykians. 689-698 Pelagon draws the spear from Sarpedon's thigh. 699-710 Argives retreat before Ares and Hektor. 711-718 Hera urges Athene to give help to the Argives. and ask permission to chase Ares from the battle. 767-791 Hera and Athene drive to the plain. Hera rouses the Argives. 825-834 Athene urges Diomedes to attack Ares. 835-863 Athene drives his chariot and helps Diomedes to wound Ares. 864-887 Ares flees to Olympus and complains to Zeus of Athene. 888-906 Zeus rebukes Ares. Paieon heals his wound. 907-909 Hera and Athena return to Olympus. ILIAD 6. The meeting of Hektor and Andromache. 37-65 Agamemnon persuades Menelaos to kill Adrestes, whom he was about to spare. bid the women to pray to Athene. 119-143 Diomedes encounters Glaukos and asks him his lineage. 144-211 Glaukos declares himself the son of Hippolochos, son of the famous Bellerophon, whose story he tells. 212-236 Diomedes tells how Bellerophon was a guest friend of his ancestor Oineus. They exhange armor as a sign of their friendship. 237-262 Hektor comes to Troy and the palace of Priam. He finds there Hecuba, who offers him wine. 263-285 Hektor will not drink. He bids his mother to entreat Athene for the Trojans. 286-311 Hecuba takes a gift of a robe, and with the other women makes entreaty of Athene. Athene refuses the supplication. 312-341 Hektor finds Paris and scolds him for staying away from the battle. Paris agrees to return to the fighting. 342-368 Helen bemoans her fate and disparages Paris. She wishes to talk with Hektor, but Hektor cannot stay. 369-389 Hektor seeks Andromache, but she is gone with their child to the city walls. 440-465 Hektor refuses. He fortells his own death, the sack of Troy, and Andromache's captivity. 466-493 Hektor kisses his son and prays to Zeus to make the boy valiant and great. He bids Andromache go home. 494-502 Andromache and the servants bewail Hektor as for one already dead. 503-529 Paris overtakes Hektor by the gate, and the two leave together. ILIAD 7. Single combat of Hektor and Aias. Burial of the dead. 1-16 The Trojans make havoc of the Argives. 17-42 Athene and Apollo agree to stop the fighting. 43-53 Helenos, prompted by the two gods, urges Hektor to challenge one of the Achaians to single combat. 54-91 The fighting is stopped and Hektor issues his challenge. 92-119 Menelaus stands against him, but is dissuaded by Agamemnon. 161-174 Nine champions come forward. Nestor advises them to draw lots. 175-205 Aias draws the lot. 206-282 Aias and Hektor fight until they are separated by heralds. 283-312 Hektor and Aias part in friendliness, exchanging gifts. 313-343 The Achaians feast. The Greek assembly. Nestor advises them to bury the dead and build a wall before the camp. 365-397 Idaeus brings the message of Paris to the Achaians. 398-411 Diomedes advises the Argives to refuse, which they do. 412-432 Both sides bury the dead. 433-441 The Achaians build a wall before their camp. 442-463 Poseidon complains to Zeus of the building of the wall. 464-482 Trojans and Achaians feast through the night and sleep. ILIAD 8 The Fury of War. 66-77 At mid-day Zeus gives the advantage to the Trojans. 78-129 Nestor is almost killed by Hektor, but Diomedes saves him. Diomedes kills Hektor's charioteer, Eniopeus. who then turn in flight. 157-197 Hektor mocks Diomedes and boasts that he will burn the ships. 198-211 Hera is angry at the defeat of the Achaians. Poseidon restrains her. the tide of battle to turn. 253-272 The Achaians charge forth from the camp. 273-308 The prowess of Teukros. 309-349 Teukros is wounded by Hektor with a stone, and the Achaians are driven back to the trench. 350-380 Hera and Athene are indignant at the defeat of the Achaians. 381-396 The two goddesses drive forth from Olympos to the battle. 397-424 Zeus, through Iris, bids them turn back. 425-437 The goddesses return in awe of the wrath of Zeus. 438-456 Zeus returns to Olympus and taunts Hera and Athene. the Trojans and the death of Patroklos. Night falls. 489-565 The Trojans make camp on the plain. ILIAD 9 Embassy to Achilles. Entreaties. 1-28 The Achaeans are stricken with despair. Agamemnon summons an assembly and counsels them to return home. and Agamemnon to take further counsel with the chiefs. 79-88 The sentinels go forth to their places by the trench. whereby they may appease Achilles. 114-161 Agamemnon declares his willingness to make full amends to Achilles; he will restore Briseis at once. 162-181 Aias and Odysseus, with Phoinix, are sent on an embassy to Achilles. 182-221 The ambassadors come to the hut of Achilles, who bids them welcome and sets meat and drink before them. on the Achaians and return to the battle. Achaians to return home, as he himself intends to do the next day. 430-523 Phoinix prays Achilles to yield. He tells his own story, and how it came to pass that Peleus gave Achilles into his charge. 524-605 The story of Meleager. 620-642 Aias bluntly rebukes Achilles for his stubbornness. 643-655 Achilles replies that he will not gain enter the battle until Hektor attacks the huts and ships of the Myrmidons. 656-658 Aias and Odysseus depart, leaving Phoinix with Achilles. 659-692 Odysseus gives Achilles' message to the council of the chiefs. 693-713 Diomedes counsels refeshment and repose for the present, and for the morrow once more to set the battle in array. ILIAD 10 The Dolon episode. 1-24 Agamemnon lies sleepless for anxiety. He gets up to seek counsel of Nestor. 25-41 Menelaos likewise cannot sleep; he arises to seek Agamemnon, whom he finds arming. to visit the outposts. He himself will fetch Nestor. 131-147 The two go and arouse Odysseus. 148-179 The three arouse Diomedes, who is asleep. 180-193 They go forth to the sentinels, whom they find watching. spy to learn the counsels of the Trojans. 218-239 Diomedes will go if another will go with him; many make the offer to accompany him. 240-271 Diomedes chooses Odysseus; and the two put on their gear. 272-298 Athene gives a good omen as they go; they pray to her, and she hears. 299-312 Hector calls a council of the Trojan chiefs. He wants some man to go and spy out the plans of the Achaians. 313-337 Dolon offers to go and is accepted. He takes his weapons and goes. 338-381 He is sighted and caught by Diomedes and Odysseus. forces, and especially where Rhesos and the Thracians lie. 469-501 The two come to the camp of the Thracians and kill divers of them along with Rhesos their cheif, whose horses Odysseus drives off. 502-514 Diomedes, who would like to stay, is warned by Athene to be off. 515-539 Apollo arouses the Trojans. Diomedes and Odysseus return in haste to the camp of the Achaians. 564-579 The two warriors, having bathed, take supper, pouring libation to Athene. ILIAD 11 The Aristeia of Agamemnon. 1-14 Discord (Eris) arouses the Achaians to battle. about Hektor in the plain. 84-98 The battle goes against the Trojans. Agamemnon kills Bienor and Oileus. 99-121 Agamemnon kills Isos and Antiphos. 122-162 He slays Peisandros and Hippolochos and divers others, raging like a fire. 163-180 Agamemenon chases the Trojans to the city. 181-217 Zeus, through Iris, bids Hektor to hold aloof from fighting in the battle till Agamemnon withdraws wounded. 218-247 The prowess of Agamemnon. 248-263 Koãon wounds Agammnon, but is himself killed by him. 264-283 Agamemnon withdraws from the battle because of the pain of his wound. 284-309 Hektor urges on the Trojans as a hunter his hounds. He himself does mighty deeds. 310-348 The prowess of Odysseus and Diomedes. Diomedes; however he gets himself back again into the fight. 396-455 Odysseus, let alone among the foe, fights valiantly. He is wounded by Sokos. 456-471 Menelaos calls Aias to assist Odysseus. 472-488 Menelaos leads Odysseus out of the fight. makes havoc of the Achaians. 510-520 Machaon, being wounded, is taken out of the fight by Nestor. 544-574 Aias is with difficulty beaten back. back to his own people. 596-617 Achilles, seeing the chariot of Nestor, sends Patroklos to inquire who it is that he brings out of the battle. 618-641 Hekamede mixes a cup for Nestor and his companions. 642-669 Patroklos comes to the hut. Nestor reproaches Achilles. 670-761 Nestor tells of the mighty deeds of his youth. 762-803 Nestor reminds Patroklos of the charge laid on him by his father Menoitios, and bids him beg permission of Achilles to come forth to the battle, if Achilles will not come himself. 804-848 Patroklos returning meets Eurypylos, who is wounded in the thigh, limping out of the fight. He carries him to his hut and dresses the wound. ILIAD 12 Fighting around the wall. cross the trench, Polydamas advises that the chariots be dismissed. 80-107 The Trojans assail the wall on foot. 108-194 Asios will not leave his horses, but drives them up to the gates. Polypoites and Leonteus defend the gates; the fighting is fierce. 230-264 Hektor dismisses the omens; he chides Polydamas for his cowardice and renews the assault on the wall. 265-289 The two Aiantes heaten the Achaians. The battle waxes hot. 290-330 Sarpedon and Glaukos lead forward the Lykeans to the assault. 331-363 Menestheus, in fear of the Lykians, sends to Aias for help. 364-399 Aias and Teukros go to help Menesteus; the latter wounds Glaukos. 400-441 The stubborn fighting between the Lykians and Achaians. 442-471 Hektor busts open the gates with a great boulder, and the Trojans rush in and chase the Achaians to the ships. ILIAD 13 Fighting at the ships. 39-80 He encourages the two Aiantes. 81-124 He stirs up others of the Argives. 125-135 They make a stand about the Aiantes. 136-154 The Trojans set on them furiously. 169-205 The slaying and spoiling of Imbrios. 206-238 Poseidon meeting Idonmeneus spurs him to battle. 239-273 Idomeneus, have armed himself, meets Meriones, who is coming to the hut to fetch a fresh spear. 274-294 Idomeneus bears witness to the valor of Meriones. 295-329 Idomeneus and Meriones go forth to the battle. against the will of Zeus. 383-423 Idomeneus slays Asios, but Deiphobos slays Hypsenor. 424-454 Idomeneus slays Alkathoos and challenges Deiphobos to stand up against him. 455-486 Deiphobos calls on Aineias to rescue the body of Alkathoos, but Idomeneus stands his ground. 487-520 The fight rages around the body of Alkathoos. 521-539 Deiphobos is led wounded from the battle. 540-575 Antilochos fights valiantly, being helped by Poseidon. 576-600 Helenos strikes Deipyros, but is himself wounded by Menelaos. 640-659 Harpalion is slain by Meriones. 660-672 Paris slays Euchenor in fulfilment of a prophecy. 673-700 The fighting on the left of the ships. 701-722 The two Aiantes and the Lokrian archers. 723-753 Polydamas counsels Hektor to call more Trojans to help him in the assault. 754-787 Hektor seeks in vain for Deiphobos and Adamas and Asios and others; he rails at Paris, who bids him lead on to the battle. 788-820 The Trojans rally after Hektor, whom Aias taunts. 821-837 Hektor in turn taunts Aias, and the Trojans charge the Argives. ILIAD 14 The Deception of Zeus. hut and sees the Achaians flying in rout. 64-102 Agamemnon advises flight, but Odysseus is indignant. 153-221 Hera arrays herself for the beguiling of Zeus; Aphrodite assists and gives her a charm. 222-276 Hera asks help of sleep, who promises to do her bidding. 277-299 The two come to Ida. 301-351 The beguiling of Zeus. 352-360 Zeus being asleep, Poseidon is warned by Sleep that he may now aid the Danaans. 361-401 Poseidon stirs up the Achaians, who make strange exchanges of armor with one another. carry him out of the battle. 440-522 The fight continues. The Trojans are driven back from the ships, and many of them are slain. ILIAD 15 Rally beside the ships. with Hera, who excuses herself. 78-112 Hera comes to Olympos and recommends obedience to Zeus. 113-148 Ares is eager to avenge the death of his son Askalaphos, but Athene strips his armor. 184-217 Poseidon at first refuses, but afterward withdraws from the fight. 218-261 Zeus sends Apollo to heal Hektor and rally the Trojans. 262-280 Apollo raises great spirit in Hektor. 281-305 The Achaians are dismayed, but some withstand the onslaught of Hektor. 306-342 The Achaians are driven back in panic. 343-366 By the help of Apollo the Trojans pass the ditch and the wall. 367-404 The Trojans rush upon the ships, and the Achaians mount the ships to defend themselves. 405-428 Hektor and Aias fight about the same ship. but Zeus snaps the bowstring. 471-483 Teukros arms himself with helmet and shield and spear. 484-513 Hektor encourages the Trojans with noble words. Aias calls shame upon the Argives. 514-564 The fight goes on. 565-591 Antilochos fights bravely, but flees before Hektor. 592-652 The furious fighting of Hektor. 663-695 Aias armed with a great pike leaps from ship to ship. 696-746 The battle goes on without pause. Aias, though he fights furiously, is hard pressed. ILIAD 16 Aristeia of Patroklos. 1-45 Patroklos comes to Achilles and reproaches him for not entering the battle. He begs that he at least might enter the fight. 101-129 Aias grows tired and gives way before Hektor's onset. The Trojans set fire to a ship. 130-154 Patroklos puts on his harness while Automedon yokes the horses to the chariot. 155-167 Achilles arms the Myrmidons, who gather about him fierce as wolves. 168-209 The chieftains of the Myrmidons. Achilles urges them to battle. 210-252 The Myrmidons form battle formation. 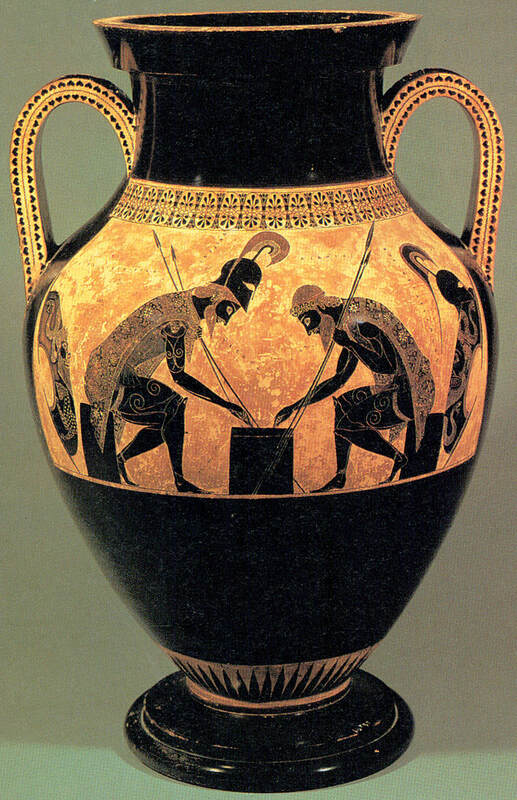 Achilles prays Zeus to help Patroklos. 253-283 The Myrmidons pour forth on the Trojans like wasps from a nest. 284-305 Patroklos and his men drive the Trojans from among the ships. 306-363 But the battle still rages furiously. 394-425 Patroklos keeps the Trojans from the city and slays many. Sarpedon to be slain, and Hera gives him counsel. 527-547 His prayer being heard, Glaukos rallies the Lykians and Trojans. 548-561 Both sides gather about Sarpedon's body. 562-631 The fight over the body of Sarpedon. 632-675 Zeus bids Apollo bear Sarpedon's body out of the battle. 676-711 Apollo rescues Sarpedon's body; Sleep and Death bear it away to Lykia. Patroklos comes close to taking the city. 712-724 Apollo bids Hektor go forth from the city to try and slay Patroklos. Kebriones out of the chariot with a stone. grows fierce, and many join in. him in the back with a spear. ILIAD 17 Aristeia of Menelaus. whose brother he had slain. 106-122 Menelaos, leaving the body, seeks the help of Aias, son of Telamon. 140-168 Glaukos chides Hektor for his cowardice. 169-187 Hektor calls on his men to fight while he puts on Patroklos' armor. 188-208 Hektor puts on the armor, Zeus declares his coming doom. 209-232 Hektor urges his men to battle. 233-255 The Trojans rush on the two. Menelaos calls loud for help. against the onset of the Trojans. 288-318 Aias slays Hippothoos and Phorkys. Hektor slays Schedios. 319-341 Apollo, speaking to Aineias, gives fresh heart to the Trojans. 342-365 The fight continues unabated. that stretch a bull's hide. 400-411 Achilles has no idea that Patroklos is dead. 412-423 Neither Trojans nor Danaans will abandon the body. 424-455 The horses of Achilles mourn for Patroklos. 456-480 Automedon with the chariot goes back into the fight. 516-542 The prowess of Automedon. 582-596 Apollo stirs up Hektor, and Zeus gives victory to the Trojans. 597-625 Idomeneus and Meriones flee from the battle. the darkness and slay them in the light. 648-672 Zeus scatters the darkness, and Menelaos looks for Antilochos. back the Trojans. The fight rages like a fire. ILIAD 18 Making of the armor. 1-21 Antilochos comes to Achilles and tells him that Patroklos is dead. 22-64 The anguish of Achilles; Thetis hears his lamentation. 65-96 Thetis comes to Achilles, who tells her of this trouble. Olympos to rouse Achilles to the battle. Trojans. The Achaians bring back the body of Patroklos. 310-353 The Achaians lament Patroklos; the laying out of the body. 354-367 The words of Zeus and Hera. 368-387 Thetis comes to Hephaistos. 388-427 Hephaistos owes his life to Thetis. 428-461 Thetis tells Hephaistos of her trouble and her desire. 462-477 Hephaistos comforts the goddess, and begins making the armor. 478-489 The shield for Achilles. 490-508 The city at peace. 509-540 The city at war. 541-560 The scenes of ploughing and reaping. 561-589 The scenes of vintage and herding. 590-617 The scene of the dance; the rest of the armor. ILIAD 19 Renunciation of the Anger. 1-39 Thetis brings the divine armor to Achilles. 74-144 Agamemnon makes the excuse that he was blinded by Atýe. they eat before they fight. but Achilles is impatient for battle. 215-237 The words of Odysseus. 238-275 The gifts and oaths of Agamemnon. 301-337 Achilles will not eat nor drink, but laments Patroklos. 392-403 Automedon and Alkimedon make ready the chariot. 404-424 The horse Xanthos foretells Achilles' death. ILIAD 20 Battle with the Gods. the men of Troy, as they will. 31-53 The gods go down to battle. 54-74 The battle of the gods. 75-109 Apollo urges Aineias to fight Achilles. 110-131 The concern of Hera for Achilles. 132-152 The gods withdraw from the battle. 153-198 Achilles taunts Aineias as they engage. 199-258 Aineias replies to his taunts. but Hera will not help to save him. 318-352 Poseidon helps Aineias take a wondrous leap. 353-363 Achilles calls upon some other Trojan to meet him in the fight. 364-378 Hektor wants to meet Achilles, but is stopped by Apollo. 379-418 Achilles makes havoc among the Trojans. 454-489 Achilles slays many more of the Trojans. trample the dead as oxen read out corn. ILIAD 21 Battle with the River. 64-113 Lykaon begs Achilles to spare him. 114-135 But Achilles slays him without mercy. 136-160 Achilles encounters Asteropaios, who defies him. 161-199 The slaying of Asteropaios. 233-283 Achilles fights with the River. 284-297 Poseidon and Athene give him courage and strength. 298-323 The River still assails him with fury. 324-341 Hera cries upon Hephaistos to fight against the River. 342-382 Hephaistos assails the River with fire. 383-413 The fighting among the gods; Athene strikes Ares with a great stone. 414-433 Athene strikes Aphrodite to the ground. 434-487 Poseidon challenges Apollo to fight, but Apollo will not. the ears with her own bow; Artemis complains to Zeus. 514-525 Apollo goes into Troy, and the other gods to Olympus. 537-589 Helped by Apollo, Agenor encounters Achilles. over the plain, while the Trojans get safe into the town. ILIAD 22 Death of Hektor. 1-24 Apollo declares himself to Achilles. 25-76 Priam from the walls vainly calls Hektor to come into the city. 77-89 Neither will Hektor listen to his mother. 131-166 Hektor flees before Achilles, who chases him round the city. 167-187 Zeus pities Hektor, but allows Athene to work her will. 188-223 Zeus dooms Hektor to die. Athene bids Achilles rest from his pursuit, while she persuades Hektor to confront him. 224-246 Athene, in the form of Deiphobos, beguiles Hektor to face Achilles. 247-272 Hektor wants to make a covenant with Achilles, but Achilles answers him with scorn. 273-288 Hektor fights with Achilles. 289-305 Hektor is advised of Athene's deceit. 337-366 Hektor, dying, makes a last request of Achilles, which is refused. He foretells Achilles' end, and dies. 375-404 Achilles devises foul treatment of Hektor's body. 405-436 The lamentation of Priam and Hekabe for Hektor. ILIAD 23 Funeral Games for Patroklos. 1-23 The Achaians lament Patroklos. 24-53 Achilles makes a funeral feast for the Achaians. 54-107 The ghost of Patroklos appears to Achilles. 108-137 The Achaians, having fetched wood from Ida for the funeral pyre, bear forth the body. 138-151 Achilles makes an offering of a lock of his hair. 152-160 Having made lamentation, the Achaians, disperse, save only the nearest friends of the dead. 161-191 The building of the pyre and the sacrifices. 192-225 Achilles calls the North and West Winds to make the pyre burn. 226-261 Achilles bids the Achaians quench the pyre and gather up Patroklos' bones. 262-286 The Funeral Games in honor of Patroklos. 287-348 The Chariot Race. Nestor gives counsel to Antilochos. 349-372 The lots are cast and the race begins. 373-416 The race of Diomedes and Eumelos; Athene breaks the yoke of Eumelos' horses. 417-447 Antilochos by cunning passes Menelaos in a narrow place. 448-498 Idomeneus and Ias, son of Oãileus, dispute about the race. 499-513 Diomedes comes in first. 514-538 Antilochus comes in second, with Menelaos close upon him. Meriones takes fourth place. 539-565 Achilles would have given the seond prize to Eumelos, but Antilochos will not forego it. 566-585 Menelaos complains of the driving of Antilochos. 586-611 Antilochos surrenders his prize to Menelaos, who will not keep it. 612-623 The fifth prize is given to Nestor. 624-650 The prowess of Nestor in his youth. 651-663 The boxing-match and the prizes therefor. 664-699 The boxing of Epeios and Euryalos. 700-739 The wrestling match: Odysseus wrestles with Aias. 740-783 The foot race: Odysseus wins first prize by help of Athene. 784-797 The pleasant words of Antilochos and his reward therefor. 798-825 A contest for the arms of Sarpedon. 826-849 The throwing of the weight. ILIAD 24 Ransom of Hektor. 22-54 Apollo rebukes the gods for letting Achilles defile Hektor's body. Hektor's body be given up for ransom. 77-92 Iris goes down to bring Thetis from the depths of the sea. 93-119 Thetis comes to Olympus. Zeus bids her bring his command to Achilles, that he give back Hektor's body for ransom. 120-140 Thetis brings the words of Zeus to Achilles, who is obedient. 141-187 Iris, at the bidding of Zeus, commands Priam to go to Achilles in his hut, and offer ransom for Hektor's body. 188-199 Priam tells Hekabe of the words of Zeus. 200-216 Hekabe seeks to dissuade Priam from going to Achilles. 217-227 Priam will not be dissuaded from his errand. 228-246 Priam chooses from his treasures the ransom for the body of Hektor, and in anger drives his sons from the house. 247-264 Priam rebukes his sons and bids them make ready a mule cart to carry the gifts for Achilles. 265-280 The sons of Priam make ready his chariot and lay Hektor's ransom on the mule cart. 281-298 Hekabe brings wine for libation, and bids Priam ask Zeus for an omen. 322-338 Priam and his herald, Idaios, drive forth on to the plain. Zeus sends Hermes to conduct them to Achilles. 339-357 Hermes, looking like a young prince, meets Priam by the river, where the horses and mules have stopped to drink. 358-385 Hermes asks Priam his errand. 386-404 Hermes tells Priam he is a squire of Achilles, and that the Achaians will go to battle tomorrow. 424-439 Priam offers a gift to Hermes, who refuses it, but consents to take the king to Achilles. 440-467 Hermes brings Priam to the hut of Achilles. Having declared himself, he departs. 468-506 Priam enters Achilles hut, and makes his entreaty. 507-551 Achilles is moved to tears, and the two weep for their dead. Achilles speaks of the lot of man, and counsels Priam to be comforted and not to mourn. He asks Priam to stay awhile. 571-595 Achilles and his squires bring in the gifts for Hektor's ransoming. The body of Hektor is washed and anointed, and laid on the mule cart. 596-620 Achilles bids Priam take meat, and speaks of Niobe, who for all her sorrows ate food. 621-642 Priam eats with Achilles and his squires. 643-670 A bed is made for Priam. Achilles promises to stay the Achaians from the battle until Hektor's funeral is performed. 671-688 Priam lays down to sleep, but is awakened by Hermes, who counsels him to make haste and get back to Troy. 689-717 Priam brings Hektor's body to Troy. 718-745 Andromache laments her husband. 746-759 Hekabe laments her son. 776-804 The burying of Hektor.